I just got back from Target and LOVE this deal!!! I had doubles of everything so I came home with 2 starter kits and 4 refills. Save your receipts and you can then use them for the $5 SC Johnson rebate when you buy any three products HERE. Remember, you can get that rebate back 3 times before July which is $15! Final Price: all for FREE with $1.37 overage! Thanks, Freebies 4 Mom, for this list! I got all of these this year. My favorite is the ABC Orchestra book because my kids love it! kids.woot.com has a Yo Gabba Gabba! 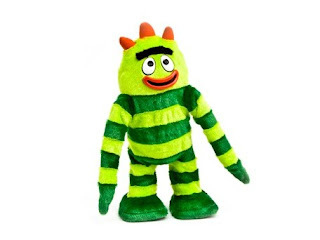 Dance Time Brobee for $9.99 with $5 shipping today. You can buy up to three and still pay only $5 shipping. This is a great deal because they are $22-$32 on Amazon and shipping is $8. Hurry, though, because Woot deals don't last long! They only sell one item a day and when it's gone, that's it. This is actually a really easy rebate to get. You can submit up to 3 forms per household as long as they are sent seperately. If you purchase ANY 3 of the following products from the following brands, save the receipt and get this rebate! The rebate must be postmarked by 07/15/10 so you have plenty of time to get your $15 back. Here is the link to the form. My kids have pretty bad seasonal allergies and between the two of them, it seems like someone is always sick. The Big One is easier to manage because he's 4 and has more options on what he can take but I am still always on the lookout for non-drug remedies. The Little One is always a challenge because he's 1 and there really aren't many medical options for him other than a doctor visit and some sugar loaded prescription cough syrup. Well, I have found The Cure. Meet Vicks© Soothing Vapors Plug-In Waterless Vaporizer. This thing is amazing! Until last night, The Little One had been coughing day and night for 2 days and has had a week of sleepless nights because of his cough. He started to sound like an old man because he was going hoarse from all the coughing. I plugged this in and within minutes, the whole room smelled like Vicks. Last night, he sleep better than he has all week (which means I slept better than I have all week) and woke up cough free. Everything else I tried (essential oil baths, herbal teas, elevating his mattress, mentol rubs on his chest) worked for a while but he would always start coughing again within a few hours. The little pads that come with it are supposed to work for 8 hours but I've had the same one plugged in for closer to 12 hours and the room still smells great. It's nap time and I still hear no coughs. The GREAT news is that Walgreens has a deal on this (among other Vicks© products) through Saturday, Jan. 2nd! If you spend $20, you get $10 back in register rewards. Spend $10, get $5 back. They are $4.49-$4.99 each (so yes, to get $10 back, you'd have to buy 5 products). I bought two Soothing Vapors (each with 5 pads), a pack of 5 replacement pads, and more Baby VapoRub. I got $5 back which was like getting one of the Soothing Vapors for free. Also, I had a coupon for free Puffs with Vicks when you buy 2 Vicks products and a $1 off any single Puffs. I don't get anything from anyone for posting this, but I am so grateful for this new product!! As a mom, it's a huge deal to find something that works and helps sick kids sleep. These work for adults, too. It's not marketed as a kids product and it's safe for all ages. Go get some because someone you know will probably cough, sneeze, or wheeze soon! Winn-Dixie has a great deal that is good through 1/5. If you buy 2 Tombstone Pizza (2/11.58), you get Winn Dixie brand breadsticks, Farm Rich mozzerella sticks, Breyers ice cream, and a 2-Liter of Coke FREE!! Sign up at Farm Rich (click coupons on the side) for 75¢ any Farm Rich product. UPDATE: I used the self checkout lane because WD was packed and it wouldn't let me use the Farm Rich coupon. The manager came over and said since they were free, I couldn't use the coupon. My advice is to go to a cashier because when they a similar meal deal with lasagna, I used coupons on the free stuff with no problem. Oh well, even without the coupon, it's still a great deal! General Mills is giving away 53,000 boxes of Cheerios. Go here to register. They will notify the winners by mail and all entrants get four $1 off coupons. You can enter daily! Also, remember to enter my giveaway for a free box of General Mills cereal! COUPON: Right now if you visit here you will find a $1 off coupon for one of four General Mills cereals. GIVEAWAY: If you post a comment below by January 2nd at 11:59 pm. I will choose one person using random.org. The prize is a coupon for one free box of any General Mills cereal (exp. 12/31/2010). This is more of a post to reiterate the importance of knowing the coupon policy. Most companies have it written and it's usually hidden on the website somewhere but you may have to ask. I do have an email into Papa John's to see if they have an actual coupon policy because if they do not, they would have to honor the advertised price of the pizza with my coupon. I'll keep you posted! I also used $7 in Register Rewards from last week so for $43.13 worth of stuff, I payed $17.68 (+tax). Not bad for 20 mins work! Go here to choose one of six Veggie Tales DVDs free. To get this, you'll have to sign up for their newsletter. Shipping is $2.99 but that's a great deal for an hour of entertainment with a purpose. I got Abe and the Amazing Promise which is normally $8.99 + shipping on bigidea.com. Go here for a 4-page sheet of good Walgreens coupons. Just at first glance, there are manufacturer coupons for a bunch of these. From the Sunday paper, I have coupons for Duracell batteries, Huggies wipes, Hershey's candy, Always and Tampax products, Pampers, and Cover Girl. Go to www.southernsavers.com for the match ups on this. Some of these things will be almost free if you use both. I am not sure if Walgreens will take the printed version of the coupons on the sheet but it's worth a shot. The hard copy version is located in the store but you'll have to look for all of the sheets because they aren't together (at some stores.) I'll let you know if they take the black and white version after I go. Since I am so money conscious, sometimes people ask me why I don't take my coupons and money saving knowledge to Walmart where prices are generally lower. I wanted to address why, for me, Walmart doesn't work. First, I would like to say that my experience does not apply to all Walmart stores and I have heard of other people enjoying hundreds of dollars in savings there so I know it is possible. I am only addressing my local Walmart. When I first realized I needed to make major adjustments in my family's outgoing money, we did shop at Walmart and I bought the lowest costing brand of everything. I have never had a problem buying generic and I have never had a certain brand I had to buy for anything. Our average weekly grocery bill was $120 for a family of 3 (and then 4) including all toiletries, cleaning supplies, and diapers. Around January, I learned that Walmart price matches. I spent two hours pursuing the ads and finding corresponding coupons. I would have saved about $80. Before I started shopping, I consulted with the customer service desk to make sure I had all the right ads and understood their price matching policy. They approved my ads and even looked at what I had circled and said I was correct. So, I spent two hours shopping because I made sure I had the right items and quantities. Keep in mind, I had two small children with me who were incredibly patient that day. When I got to the register, I told the cashier what I was doing and she helped me sort my groceries according to the ads. Then she said she needed to make sure with her manager that she knew how to do the price adjustments on the register. The front end manager came over, looked at my ads, and said, "Do you honestly think we will price match the buy one, get one items?" I said, "I checked with customer service and they said it was no problem." She then laughed at me and said, "Boy, you really are ignorant." I was completely taken aback and in shock. I told her I had spent two hours shopping and that the manager told me ahead of time I was doing the right thing. She said, "Well, they were wrong. I will not allow my cashier to do this." I started to cry and left my $200 worth of groceries on the conveyor. The cashier asked me what she was supposed to do with all that stuff. I said, "I don't care what you do with it. Put it back." The front end manager told me I had to put it back. I promptly left the store. When I got home, I called the corporate office with names and the store number. They apologized and said they would have the store manager call me. The "interim store manager" called me and said, "Wow, yeah, that wasn't cool. I'll definitely leave a note for the manager when she gets back in town." I called back two days later when the actual store manager was back in town and she apologized saying she reprimanded the woman who called me ignorant. The store manager also said that "technically" Walmart doesn't accept buy one, get one price matching but that she was ok with it "due to the economy" but didn't make it known among the cashiers or front end managers. I never felt much remorse from anyone. In fact, they all acted like this kind of thing happened often. It left a very bad taste in my mouth. All in all, Walmart has a very ambiguous coupon policy that differs from store to store. I do not work well without set rules, especially if I am putting in time doing the legwork. My local store will accept many ads and coupons but it absolutely depends on the cashier. I am not ok with that. I do not want to fight for the ability to save money. Another reason I do not like Walmart is that everyone who works there is either in a rush or acts bothered by customers questions. They seem like their jobs would be much more pleasant if all the people would leave the store. I have never left Walmart feeling happy or with a positive attitude because the staff doesn't smile or make me feel glad to have chosen to shop there. That negativity spills over into everything. The bathrooms are never clean, the shelves are sloppy, and the store even smells bad most of the time. Again, I could not and would not say if this is true of all Walmart stores but it is true of the store closest to me. I suppose I could drive 10-15 miles and test my theories but the added time and gas would take away from my total savings. I'll stick with where I know I can save money regardless of the cashier I choose and where I will be greeted with a joyful hello. I'd love to hear positive stories about good shopping trips to Walmart! Hoorray.com is giving away a limited number of 20 page 9.5 x 8 soft printed photo books. You can choose from holiday, travel, or wedding theme. You do have to pay $8.99 in shipping but you fit a whole bunch of pictures in 20 pages. It's still a pretty good deal especially considering the size of the book! I had at least one coupon for everything I bought except the bread. I stacked coupons (Publix from the Green Advantage flyer or Family Holiday magazine with a manufacturer coupon) or they were BOGO and I had two coupons. This has never happened to me before but they even had to bring a manager over to override the register because I had more coupons than I had stuff! The cashier and manager looked at my stuff and coupons and said I was doing everything exactly to the letter of the coupon policy. My Favorite Bag Boy, who never says much, leaned over to see the register screen while I was paying. I asked him if he was seeing how much I saved and he said, "I just had to look." No, this is not a week's worth of groceries but I'm pretty stocked up. All we needed this week was bread but we have a bunch of Christmas parties so I would have had to buy cookies soon anyway. I am having trouble getting The Big One to drink anything because he says he hates everything other than Sprite so I am now on a mission to find anything remotely healthy that he will drink. The juice was a fulfills that. My husband loves the Yakisoba noodles and will eat them as an after dinner snack. I didn't buy anything we won't use so it was a good trip. Starbucks coffee (12-14 oz bags) - Buy 3 bags for $7 each, get a $5 gift card. That's a $5.33 Christmas gift! Glade candles (1-pk. PlugIns oil refill, 4-oz. candle or scented oil candle tin, or 4-ct. oil candle refills) - Buy 5 at $2.50 each, get a $5 gift card. You should have a bunch of Glade coupons saved up from the past month. Here is an example of how you can get 6 Glade products candles for $1-$1.50. Buy one oil candle holder, 3 oil candle refills, a Plug-in warmer, and a Plug-in oil refill. Buy any Glade Plug-Ins Scented Oil refill, get a warmer free. Buy any Glade Scented Oil candles holder, get a refill pack free. Save $2 on two Glade Scented Oil candle refill packs. Rayovac alkaline batteries - (Free - 50¢) Check the $1 section for 2 packs of these. Make sure you get the alkaline because there is another type there, too. I had 5 save $1 on any pack of Rayovac batteries from the newspaper so I got 5 packs for free. I also had a save $1 on any 2 packs so I got those 2 for 50¢. In all, I got 7 packs of batteries (AA and D) for $1. That is about 15¢ a pack!! Johnson's Bathtime Buddies - (Free) Use the $1 off any Johnson's product coupon. I had 2 of them and these are 97¢ each so I got two free. The cashier did tell me that since they were only 97¢ and my coupons were for $1 off, I could not get the extra 6¢. I said ok. Become a fan of Stacy's Pita Chips on Facebook and they will mail you a coupon for a free bag of chips. They are usually $3.99 at Publix so it's a great freebie! I bought some of these for Thanksgiving and they were amazing with guacamole! My boys loved them, too and I felt fine about letting them snack on them because they are actually pretty healthy. Do this quickly because I'm sure this promotion won't last long!!! One of the ways I actually make money is through (reputable) online sweepstakes and instant win games. Here is a list of the games I have actually won or know that people are winning. I have a folder in my bookmarks called “Daily Win!” and since you can play or enter these every day, I do just that. Some of them have multiple prizes or grand prizes along with the smaller instant win prizes. I have read on other blogs that the best time to win is late at night or early in the morning but I typically play after the boys get up (8am) or during nap time (12pm-2pm) so it seems like time isn’t as big a factor as some people think. I will say, however, that if I play every day for 2 weeks or so and win nothing, I will try switching to a later time. That worked on the Wendy’s game. You do have to sign up for most of these but they do not bombard you with 10,000 emails. Some will send you coupons so it’s actually really good. If you are going to enter daily, signing up makes it very fast later. These games change all the time so play it every day. I have won DJ Hero for PS2, a $15 Best Buy gift card, and a $10 Best Buy gift card from Coke. I won a $10 Home Depot gift card playing this game. I played everyday for two weeks and got annoyed because I never won so one night at 11pm, I tried again and won on the first try. I won a $100 gift card to Newport News last month. I won a $25 Starbucks card in the Instant Win games. It may seem like alot of work but it takes me about 10 minutes every day to enter all of these since they are saved in my bookmarks. For the $260 worth of prizes I have won, it seems worth it to me. Weigh it out for yourself. If there are prizes you really don’t want, then skip that one. When you win, share the joy with all of us! Good luck! !